Few companies are immune to email overload inside their organization today, it’s costly and needs to be managed. It’s no secret that email overload is a huge issue for many organizations and has an equally big impact on the kinds of alternatives and investments that are needed to reach your internal audiences when email can no longer be counted on. In my latest eBook, The 7 Most Important Ways to Reduce Email Overload @ Work, we’ll offer you some critical background and strategies to help you manage email in the most effective way possible. 1. Identify email personas and attack the bad behaviors: The use of these email personas can help employees identify and tackle bad email. 2. Recognize email overload as a serious productivity issue: Irrelevant emails are costing companies major time and money. 3. Get to the heart of your specific email problem: Before you can do anything about email volume, it’s important to first understand the stress caused by email overload in your organization. 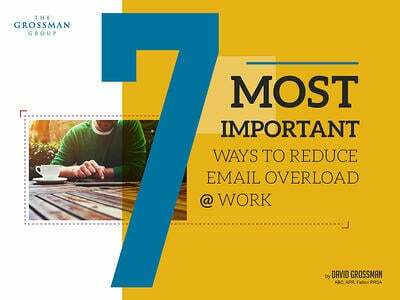 Fill out the form to the right to download—7 Most Important Ways to Reduce Email Overload @ Work—and gain a more productive workforce.